Renting some sort of a vehicle for our Iceland trip felt like a no-brainer. Public transportation doesn’t really exist outside of Reykjavik (the main hub) and we weren’t interested in the tour bus route. We really loved our decision to rent a campervan and wouldn’t have done it any other way (hashtag no ragrets). In doing our research for campervans, we found that there are a lot of companies that all seem to offer the same basic van + add ons. Their prices are also around the same. Some companies will include things like the stovetop, and others will charge for those items. We went with Kuku Campers because they seemed to have a lot already included. Some of the add ons could include a camping table and chairs, a grill, sleeping bags, stove-tops, propane, a guitar, GPS, mobile wifi, flashlights…you get it, camping stuff. It’s nice that they do offer these things because there’s no way you’d bring half of this stuff on the plane with you. The add ons that we went with were 2 sleeping bags, 1 blanket, 2 pillows, a stove top, and a cooler. We didn’t feel like we were missing anything or wanted more. Honestly, I don’t think we could have fit anything else anyway. Campervans = your car and your hotel in one! The campervan gave us a crazy amount of flexibility as far as where we went and where we stayed. If we had a particularly long driving day, we could pull off at a picnic spot and take a quick nap because ~hellooooo~ our bed was in the backseat! That was easily the greatest part & best perk of having the van rather than just a rental car + hotel/AirBnb reservations. The one hitch with living this way for a bit is that you still have to eat…yet there isn’t a refrigerator attached to the van. We had a cooler and would just fill it up with ice whenever we saw a major grocery store. Gas stations don’t carry ice, so it has to be a grocery store. Think about this when you’re buying groceries and what not! Even though “wild camping” – pulling off anywhere for the night and setting up camp – is not allowed any longer, there are plenty of really nice campsites all over the country to make up for it. We went into the trip believing that we wouldn’t be able to shower for 10 days (eeek). WRONG! Every campsite we stayed at had awesome bathrooms with hot showers! I think I showered more on this trip than I do in real life. One campsite had heated floors in the bathroom and another had a completely open shower. Each campsite charges by the person and it was usually around $14/each. Showers were sometimes extra and you had to pay by the minute. You’d give the camp owner cash and they’d give you back 100 Kr coins (less than 1 USD) that give you 5 minutes of hot water. There were definitely sites that didn’t charge for showers, but we didn’t really rely on that and were always ready to pay. Something we didn’t really think about when we were planning the trip was gas money. It seems so obvious, but when planning a big trip sometimes the most obvious of things can get lost. The rental company suggested that we fill up every time we hit half a tank just in case we end up driving through a section that is void of civilization – which happened a lot. We’re glad we listened! We ended up spending about 50-60 USD every time we filled up from half a tank…and we had to do that nearly every day. So as you can see and imagine, gas was a huge expense. Make sure you don’t forget about that small detail like we did…yikes. Speaking of gas, because it rains A L O T and there are a lot of dirt roads, (you can imagine what it did to our van and everyone else’s) every gas station had a car wash station that was completely free to use! You just pull up, grab the hose-scrubber combination and wash away. We went with the Category A van, which is the smallest option that seats & sleeps 2 people. Had we the chance to do it again we’d probably size up on the van just so we had room to move around and change our clothes in the upright position. Getting dressed in the van was an ordeal with our suitcase, two grown adults, and a van barely taller than me. It was actually pretty funny how small it was and we oftentimes had a laugh about it. We’re both light hearted and easy going people though, so we just took it in stride. 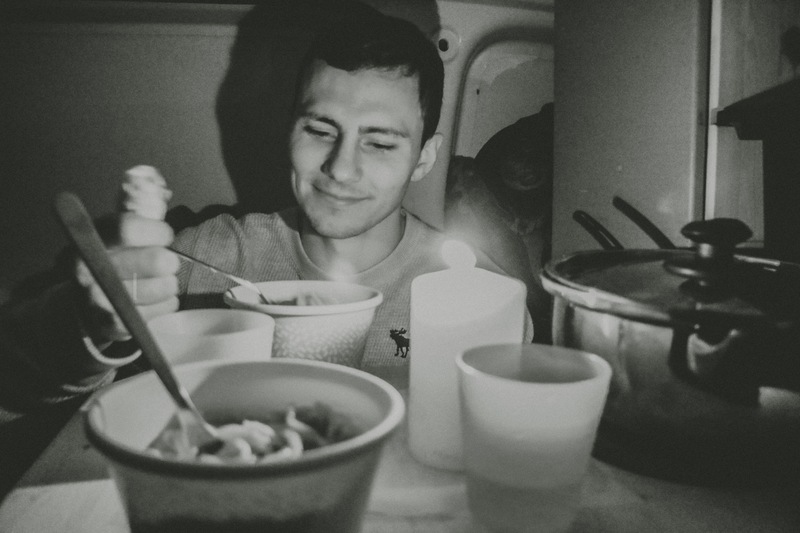 Something else we didn’t think about was cooking/eating in the van. Whenever we would cook (which was at least 2 times a day) we would have to stand outside in the elements – sometimes after dark – until our food was cooked. 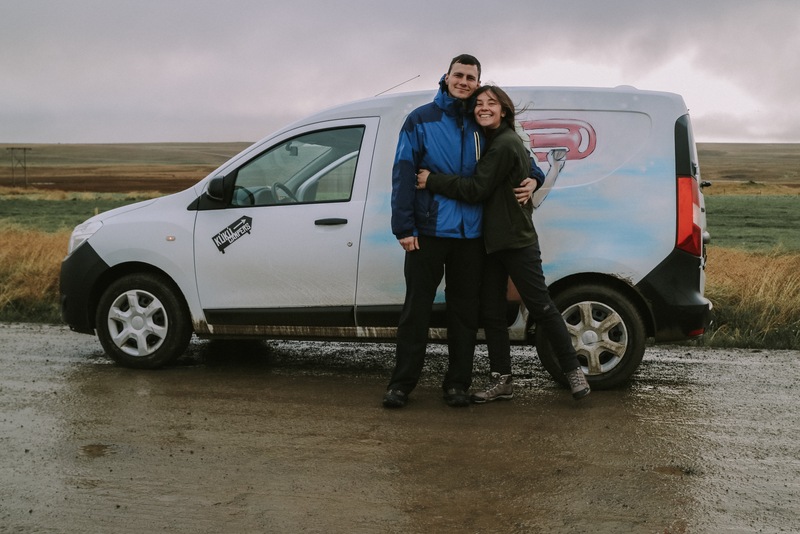 Surely that’s camping in general, but if you’re not into standing in Iceland’s wind and rain while you cook your spaghetti, probably opt for a van thats a big bigger so you can cook inside. A lot of campsites do have indoor cooking facilities, but that’s really only good for breakfast and sometimes dinner if you make it there before dinner. There were a lot of meals we’d have just pulled over at a quick rest stop or in front of a monument…which we were STOKED about. It was so cool. 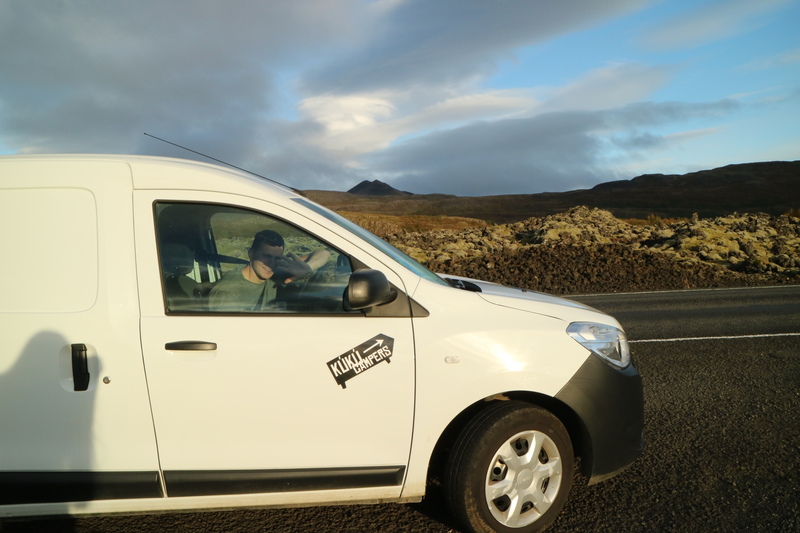 Traveling Iceland definitely would not have been the same had we chosen to not rent a campervan. We really feel that our experience was elevated by the flexibility & protection (from the winds!!!) that it offered. 10/10 times we would do it again! 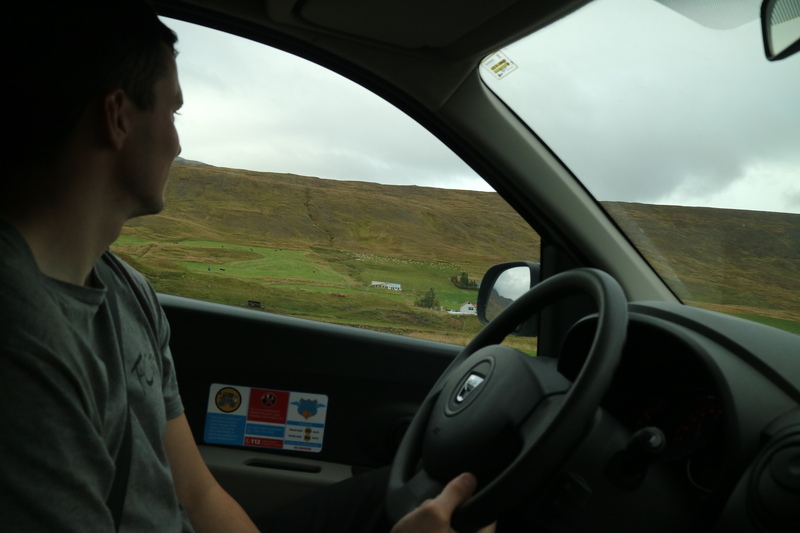 If you have questions about campervan camping around Iceland or have a funny story from your own experience…I’m all ears!